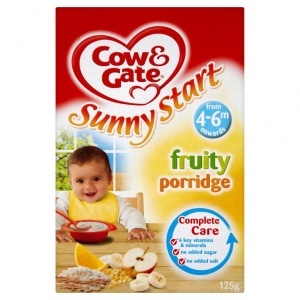 Cow & Gate Sunny Start breakfast cereals are especially made for babies with 6 key vitamins and minerals - and, unlike some family breakfast cereals, they contain no added sugar, salt, artificial flavourings or preservatives. Our wide range of delicious fruits and healthy grains is ideal for your 4-6 month old baby - smooth in texture, simply flavoured, and with key nutrients. How is that for a Sunny Start? ... your baby needs to explore how to deal with a new texture and get used to a new taste. Moving food around in their mouth, pushing it backwards and forwards, and sometimes out with their tongue, is all part of this. The contents of this pack may settle. per 100g dry product : Energy 1825kJ/433kcal, Fat 12g, of which, saturates 5.3g, Carbohydrate 66.1g, of which, sugars 40g, Fibre 3.2g, Protein 13.6g, Salt 0.3g, Vitamin A 290µg, Vitamin D 5µg, Vitamin E 2.5mg, Vitamin C 40mg, Thiamin (B1) 0.7mg, Riboflavin (B2) 0.7mg, Vitamin B6 0.4mg, Niacin 6.9mg, Biotin 16µg, Folic acid 107µg, Pantothenic acid 3.5mg, Calcium 390mg, Iron 4.8mg, Zinc 1.9mg, Copper 0.2mg, Iodine 70µg, 1Per 25g cereal made with 75ml of water, *LRV (Labelling Reference Value) is a guide to the amount of vitamins or minerals needed per day to meet the requirements of infants and young children. Using a clean bowl and feeding spoon, mix 1 spoon of cereal with 3 spoons of your cooled boiled water and stir. As your baby grows their appetite will too, just use a larger spoon to make a bigger serving. If serving warm, check the temperature of the cereals before feeding. This is only a guide, if you want to alter the consistency, add more or less liquid as required. Do not leave your baby alone when feeding.